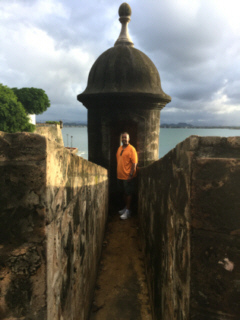 This was the third visit to San Juan, Puerto Rico for Traci and me. (You can read about our first visit here.) As such, my original plan was to just wander on our own instead of signing up for a shore excursion. However, wandering while on vacation almost never goes over well with Traci because she feels like we would be missing something of interest. 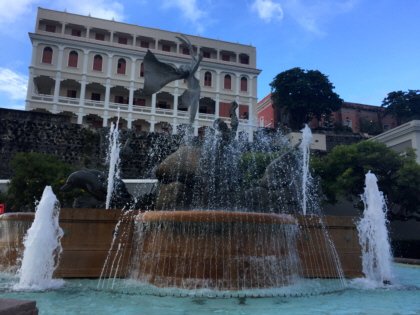 Therefore, the day before we arrived in Puerto Rico, we looked through the list of the available shore excursions for San Juan and settled on the Cuisine Tasting & Historic Walk. Even though we've approached San Juan by cruise ship before, this was the first time I got a glimpse of the Castillo San Felipe del Morro fort from the ship. It was marvelous! The dark battlement has existed here in some form since the 1500's. Even today the sight of the imposing structure jutting into the sea is formidable. Our shore excursion was a 4-hour walking tour. It was entertaining (and overpriced - seems most ship excursions are). 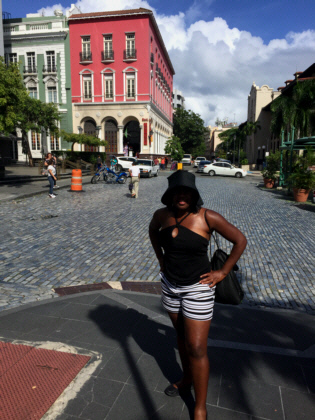 Our guide led us through some of the streets of Old San Juan mainly near the port. 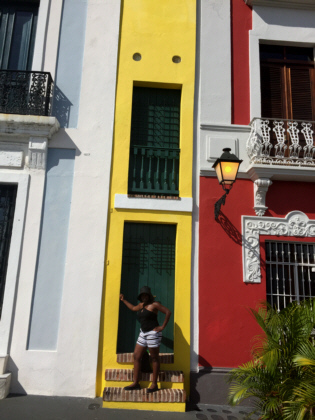 The colorful buildings and the surrounding water really put us in a touristy mood. Our guide led us along the trademark blue cobblestone streets pointing out interesting sights such as a very narrow row home measuring just a little over 5 feet in width. We saw sculptures, guard posts, a centuries old City Gate, a former prison, and a bunch of other sights we would have missed had we gone with my original plan to just wander. Additionally, we had the advantage of our guide’s historical and cultural commentary. Her passion for preserving the islands historical monuments really came through in her narration. Our guide did discuss the Zika virus that was in the news at the time of our visit. Puerto Rico and other Caribbean islands had been hit hard according to the media. This was serious stuff. Norwegian had sent each passenger a letter containing CDC (Center for Disease Control) recommendations on how to protect yourself. The virus is transmitted by mosquitos and has been linked to severe birth defects in children born to mothers infected by the virus. Our guide said that she did not know anyone personally who had been infected by the virus - other than herself! She said the symptoms caused her to feel miserable for three days. Traci and I were a little thrown off by the description of this shore excursion as a "cuisine tasting" tour. We thought we would be visiting various restaurants around town and sampling Puerto Rican food. This was not the case. 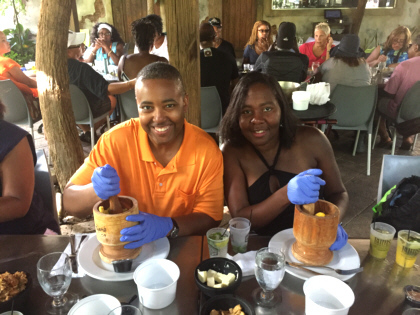 Instead, we were taken to a restaurant where a chef came out and explained how to make mofongo. The ingredients for this Puerto Rican dish were brought to the table. The chef gave us verbal instructions and we were given the opportunity to make the dish. We also had the opportunity to taste two types of Puerto Rican mojito drinks. 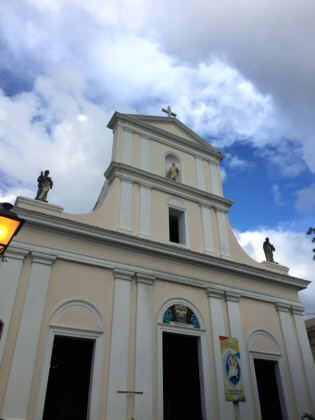 At the conclusion of our restaurant visit, our group was given the option of returning to the ship or continuing on to check out the San Juan Cathedral. Of course, Traci and I who always want to experience as much as we can were among the group who opted to see the cathedral. The original cathedral was built in 1521 but had to be rebuilt in 1540 after it was destroyed in a hurricane. The church has changed quite a bit since then. 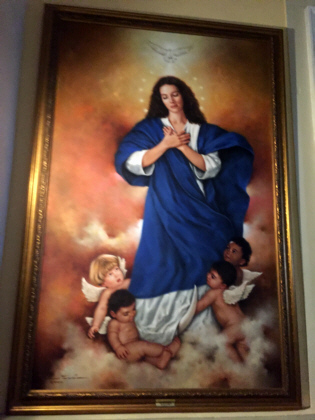 We walked around quietly inside the sanctuary and admired the religious art work. 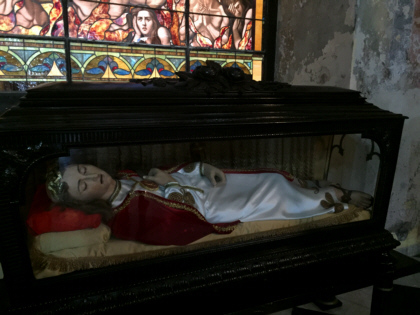 One of the more intriguing sights of the church is the body of Saint Pius preserved in wax. Had our guide not told us what this was, I would have thought it was a painted statue laying inside a glass case. Although you mainly see the embalming wax, if you look closely, you can actually see the teeth of Saint Pius.